Welcome to the beautiful Sunset Victorian Retreat in South Haven, Michigan. This charming 5-bedroom, 3-bath vacation home sleeps up to 16 with unmatched space and comfort. Located on a corner lot on a quiet street, we are walking distance to downtown shopping, dining and the beach. South Haven vacation rental has everything you'd expect - and more! Sunset Victorian Retreat includes everything you would expect for a wonderful vacation. Grab a favorite book and relax with your morning coffee on the large wrap-around porch. Family and friends can enjoy breakfast around the large kitchen bar counter that opens to the spacious dining and parlor areas. After a fun-filled day spent at the beach, shopping in town, or playing golf, groups can gather and enjoy a cookout on the large outdoor patio equipped with plenty of tables and chairs. Kids can play in the large yard and use the swing set, basketball hoop, and bean bag toss yard games. Then top it off by creating unforgettable memories by the fire pit on cool South Haven evenings - can you smell the s'mores? This vacation rental home is ideal for large family, multi-family, multi-generational family get-togethers and reunions...church groups, women's groups, retreats, weddings, or any family wanting some additional space to spread out! What are you waiting for? Come. 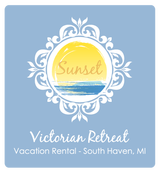 Enjoy and relax at the Sunset Victorian Retreat in wonderful South Haven, Michigan. All Rights Reserved, Sunset Victorian Retreat - 2012-2019.